Chandigarh : Kirron Kher, Member of Parliament has taken an initiative to solve the problem of traffic congestion at Tribune Chowk. In a letter written today to Shri Nitin Gadkari, Union Minister of Road Transport and Highways, she has strongly desired that some sort of flyover or combination of flyover and underpass be constructed at Tribune Chowk so that there is no traffic congestion at this Chowk. She has stated in her letter that as this important junction falls on National Highway 5, in principle, approval be granted to this work at the earliest. Further, she has written that the appropriate design of it can be finalized in consultation with the National Highway Authority of India (NHAI) and Chandigarh administration. Later, she talked to Shri Gadkari on Telephone and explained him the exact problem. He said that he will go through the letter and will get back to her very soon. about 3 lacs and on the 3rd direction another town, Panchkula, of about the same size, along the National Highway 5 there are other smaller townships like Zirakpur and Derabassi. Further she has stated that Tribune Chowk is suddenly faced with so much traffic that was never imagined. Chandigarh Administration, in the recent past, through professional consultants has got prepared a couple of alternatives so as to avoid traffic coalescing at the junction. Most of these alternatives, involve some sort of flyover or combination of flyover and underpass. It may be mentioned that more than 2.5 lakh vehicles cross the Tribune chowk every day. This, being the only entry and exit point for the traffic moving from Zirakpur, Ambala and parts of Punjab, the traffic snarls are witnessed at Tribune Chowk due to which the commuters have to waste more than 10 minutes to cross this Chowk. It may be remembered that In the Comprehensive Mobility Plan submitted to the UT Administration earlier, the RITES had stated that Tribune Chowk exhibit high traffic volumes (more than 1,00,000 Passenger Car Units). 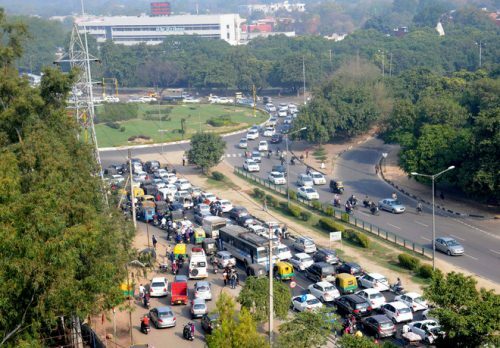 The daily traffic volume (16 hours) of total vehicles of 1,43,170 including 1,35,805 PCUs (passenger car units) was observed at Rotary of Dakshin Marg and Purv Marg near Sector-31 Tribune Chowk. After that, the UT administration had asked its Engineering Department to explore the proposal for construction of cloverleaf type flyover to allow seamless traffic flow at Tribune Chowk junction, as already been designed by the consultant appointed for the purpose. But this proposal is hanging fire for many years.